This is, to borrow the modest sub-title of the book, "An Informal History of the East African Railways and Harbours Administration" between the years 1948, when the largest public transport undertaking in the whole of the Colonial Empire was inaugurated through the merger of Kenya and Uganda Railways & Harbours and the Tanganyika Railways & Port Services into a single organisation, and 1961, when the inter-territorial East African High Commission (EAHC) underwent its metamorphosis into the East African Common Services Organisation (EACSO). These several institutions are the original service of very many members of OSPA, who will quickly recognise the title from the well-known Swahili term 'gari la moshi' used to describe a railway train. The book is thus in the grand tradition of and a worthy successor to Mervyn Hill's magnifcent two-volume official history of the three separate East African Railways, Permanent Way (1950, 1959) and Ronald Hardy's history of the building of the Uganda Railway in 1892-1901, The Iron Snake (1965). 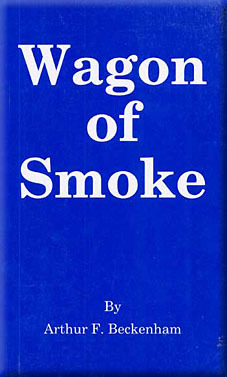 If it is consciously less entertaining for the general reader then Charles Miller's superb The Lunatic Express (1971), appropriately sub-titled "An Entertainment in Imperialism", for the railway buff Wagon of Smoke represents a veritable encyclopaedia of professional details, technical data and the minutiae of institutional history. To this wealth of detail in the text are added three dozen illustrations and numerous maps, diagrams and tables in the text, along with eighteen appendices accounting for ten per cent of the whole 400 pages. These cover not only biographical notes on the EAR & H general managers (Dalton, Kirby, Farquharson and Mackay, one a C.B.E. and three of them knighted) but also staff, traffic and freight statistics for each year from 1948 to 1961, the eight-page pro-forma of a Traffic Inspector's Station Inspection Report, and the names of every locomotive in the 29-31,59 and 60 classes (over 150 in all, though the chronology of Class 60, East Africa's Governors, eludes me). All in all, very much a professional's book. To the author, who served with the GWR, RE and then the EAR & H from 1950 to 1962, Wagon of Smoke is at once a labour of love - and a memorial to a courageous man. The origin of the enterprise goes back to 1981, when Arthur Beckenham was recovering from surgery for the cancer which had forced him to retire early from his influential Directorship of Education and Training at the Chartered Institute of Transport in London. The nearly 200,000 word manuscript. was complete in 1987 but sadly Beckenham died in August 1988, nine months before publication.